Are you ready to take your taste buds on a delicious ride? If you're a fan of waffles, chocolate, caramel, pretzels, and ice cream (and who isn't, really? ), then you're going to love this Disney dessert. 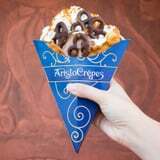 Walt Disney World visitors can find this Salted Caramel Bubble Waffle at AristoCrepes in the Disney Springs Marketplace for $9. It looks almost too good to be true.